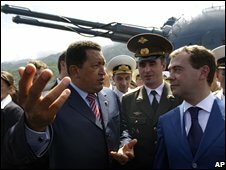 Russia has rejected claims the operation is aimed at "third countries"
Russian President Dmitry Medvedev recently completed a tour of Latin America that was intended to strengthen his country's influence in the region. 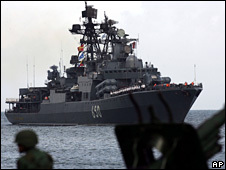 Ahead of the operation, Venezuelan and Russian officials rejected suggestions that they were aimed at "third countries". "This series of exercises aims to evaluate the skills and capabilities of the fleets of both nations to fight against terrorism and drug-trafficking," said Russian Vice-Admiral Vladimir Korolev, deputy commander of the Northern Fleet. "A few Russian ships [are] not going to change the balance of power," she said. Correspondents say Washington has been concerned by major arms deals between Russia and Venezuela since 2005, which have totalled some $4.4bn (£2.39bn).